In the first part of the series, the process seemed a little fuzzy both in language and direction. I went for a little outside inspiration to clean that up. I’m a really big fan of Ruth Colvin Clark’s work. She writes a lot about evidence-based practice. Her books are really accessible and her evidence is consistently cited. Reading Ruth’s Evidence-Based Training Methods provided some nice language alignment for the lower sections of the funnel. “Media” is a compound term. A mental model to clarify what we’re talking about should be helpful to communicate selections. Four more important things to point out before digging into this process. Solution categories, intervention types, delivery media, and methods and modes are almost never an either / or proposition. Don’t think just because the task profile indicates training as a solution that a job aid can’t also be helpful. Don’t think just because a self-paced module is indicated that an on-the-job coach or network or community channel can’t add value. Think about non-traditional solution types as you run through the levels. For example, at the top two levels you might see alternate categories that are less formal than a top down approach. Maybe a system addition of social media to connect workers is the right pick. These types of solutions aren’t handled in traditional selection models. Many factors determine “good fit” for a solution including available resources and sustainability costs. Apply insight to your data and weigh all of the visible influencers when making trade-offs. A solution that appears like a perfect fit at first blush can appear less-so under the full light of all factors. Make sure you have a Plan B. Avoid the tendency to select a category, intervention type, delivery media, method, or mode because “it’s the one your most familiar with” or “the one you’ve seen the most often.” There’s a strong tendency for conditioned bias to be the largest influencer in designed decisions. Resist the urge. Challenge your own assumptions. Use data when you can. Use insight always. With that out of the way, let’s wrap up this part of the series with some definitions of what we mean by solution category, intervention type, delivery media, instructional methods, and communication modes. There are many ways to derive the coarse level solution selection. We use the Harless / SABA Peak Performance process to narrow this level based on a DIF (difficulty, importance, frequency) calculation. At the top of this funnel, the category indicates job aid, job aid with orientation, job aid with extensive training, and training. In the case that the performance deficiency has nothing to do with skills or knowledge, none of the above is the right selection. In this case, this process stops. At this level there are several major types and permutations of sub-types. For a specific task or skill you may determine that self-paced study, facilitated instruction, or on-the-job training is appropriate when a training solution is indicated. 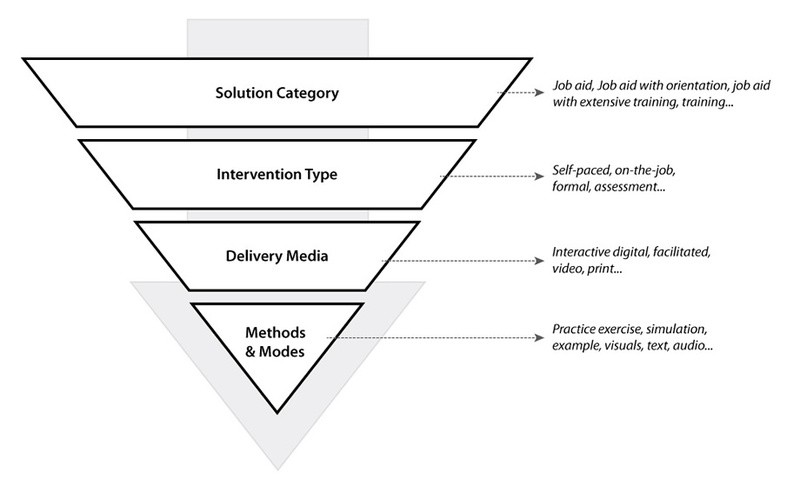 As delivery media options are identified (the next step in the process), sub-types of intervention become easier to see. As mentioned, this isn’t necessarily a linear process. There are many considerations including instructional methods, resource constraints, audience profile that can weigh one option heavier than another. Delivery media is defined as devices that deliver training and support for skill development. Delivery media is selected to support the intervention type and should not be selected arbitrarily or before the solution category and intervention type have been determined. Don’t jump to delivery media conclusions before you’ve been able to show how you reached the conclusion. Constraints may guide delivery media decisions. This definition of media includes interactive digital media, instructor facilitation, video, print-based package, etc.. According to Ruth, instructional methods are techniques that support one or more of the events of learning. These can include something as simple as an annotation, the employment of a practice exercise, or the use of an example. Choices made in the intervention type and delivery media stages of this flow may constrain the available instructional methods and modes. Again, credit goes to Ruth for this definition. She defines modes as basic communication devices present instructional methods. This provides choices of graphics, words in the form of text or audio, and other audio uses. Things like podcasts and animations are supported by mode selections. There’s a natural order to this model and each level further refines the selection indicated in the previous level. Solution Category (i.e., training) > Intervention Type (i.e., formal training) > Delivery Media (i.e., Online Instructor) > Instructional Methods (i.e., Examples and Practice) > Communication Modes > (i.e., Text and Audio). The selections at the bottom of the filter progressively support the levels above. Everything should connect, showing how each conclusion was reached and exposing determinant factors to ensure that picks aren’t just arbitrary guesses. One of the challenges in developing a model for decision-making is determining a consistent language and firming up relationships between levels in a process. I think the funnel is pretty close. There aren’t many obvious gaps that I can see. Now that the outputs have been defined, profile determinants can be constructed to map through each potential output. Next Next post: Life should be defined by what we are for, not what we are against.